Jordan Brand set to drop the Chris Paul Retro 5 PE later this year. While playing for the New Orleans Hornets in 2006-2007, Chris Paul laced up 'home' and 'away' Air Jordan Retro 5 Player Exclusives in the team's eye catching colors. 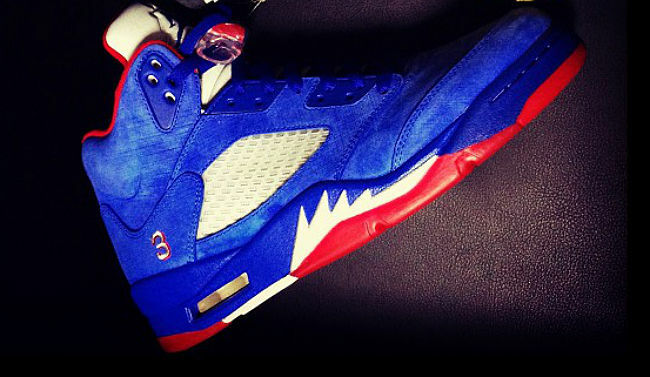 For the last six or seven years, CP3's 5s have become two of the most sought after pairs by PE collectors. While most of us will never have a shot at adding either of those pairs to our collections, the Jordan Brand may be on the verge of putting another CP3 Retro 5 in stores. We're still awaiting release details for the CP3 Retro 5, but in the meantime, let us know if you plan on picking up a pair when they drop.